Thank you to everyone, the vendors, the volunteers and the exhibitors who made our 2017 show such a success!! This challenge is only open to members of WSQG in good standing. 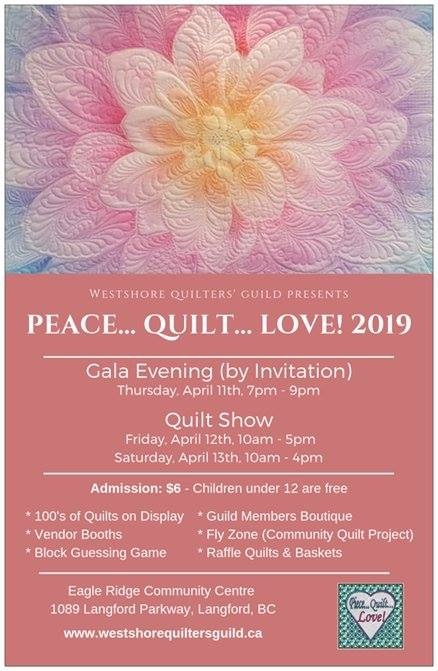 Your challenge project for this show is to make and 18.5 quilted block that, after the show, will be strip pieced into a Quilt of Valour. The kit which you can purchase from Donna Sims includes, 1 generous fat quarter of red fabric. This is used for the backing of all blocks to give the finished quilts a better look. 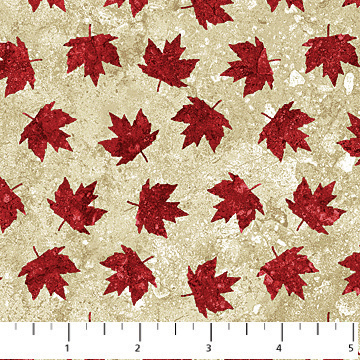 1 fat quarter of maple leaf print. At least 50% of this fabric needs to be used on the front of the block. 1 fat eighth of red fabric. At least 50% of this fabric also needs to be used on the front of the block. Add any other fabrics you would like to complete your chosen block pattern. *Please do not wash your fabric. *Please use either Warm and White or Warm and Natural for your batting so all blocks are the same thickness. Please return all your blocks to Donna Sims by the March 2017 guild meeting. If you are unable to do your block for any reason please either donate it or return it so we can complete 3 quilts of Valor. 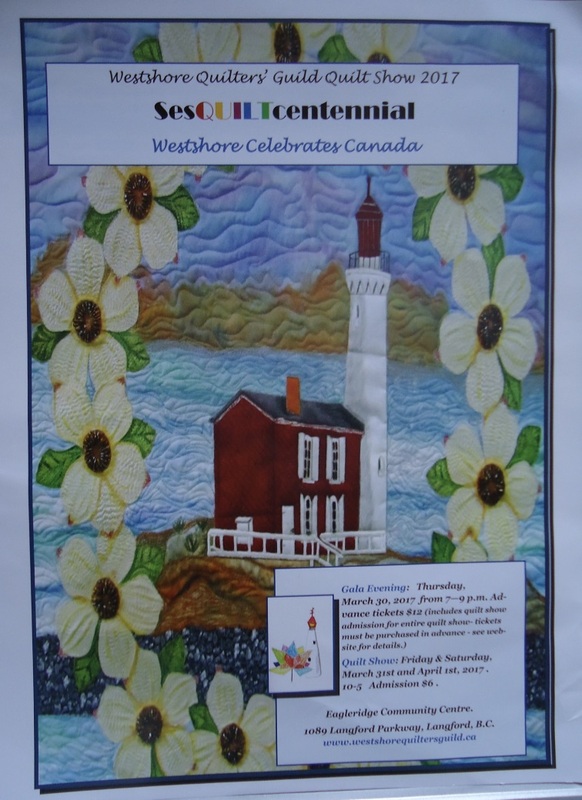 Block Game for the WQG Quilt Show 2017 – Canadian Eh! The theme of the show and game is Canada’s 150th year. Please see Gail Hogarth, Tammi Ford or Cristine Goodwin for a kit. Your block is due at the January 2017 meeting. Binding is provided in the package. please sew your binding to the back and hand sew to the back. When finished – pin your the # from your kit to the back of the block. Put your finished block in a brown paper bag and give your block to either Gail Hogarth, Tammi Ford or Cristine Goodwin. Prize for viewer’s choice is a ribbon and their is a draw if you bet your loonie. The quilt made will be donated to The Cridge Women’s Transition House. Transition House is a safe place for women with or without children who are escaping violence or abuse in their homes. Each woman and child who comes through Transition House receives one or our quilts. Each participant choose a numbered package which contains four fat quarters, two block patterns (one simple and one more challenging) and an index card with the kit number and blocks on the front. You choose which block you would like to make. Your an make the chosen block whatever size you want. You can even choose to make both blocks if you like. Cut a small piece off each fat quarter and attach to the back side of card. The quilt you create must contain the 4 fabrics you were given, and must show the chosen block somewhere in the quilt. You can make your quilt using the same block throughout or you may add blocks of your own choice, along withe the chosen block. Your quilt can contain as may other blocks as you like. Your quilt must measure a minimum of 50 x 70. Your quilt can be larger if you choose to make it larger but please do not make them smaller. Batting will be supplied but you must supply your own backing. Please be sure to attach the index card to the back of the quilt with a pin, making sure your fabric samples have been attached to the card first. All finished quilts will be on display for the public at the 2017 quilt show, Mar 31 and Apr 1 2017. Once the quilt show is over they will be donated to the The Cridge Women’s Transition House. There is a $5 refundable deposit for each kit. If you wish to have your deposit returned once your quilt is turned in please let us know at the time you turn your completed quilt in. If you do not turn in a quilt at the end of the challenge period your deposit will be forfeited. Any deposits not claimed will be used by the Charity Society to purchase supplies for future charity quilts. Deadline for quilts to be turned in is February 28th, 2017.